I am a person that always drags around too much stuff. I try to pack lightly, but at the same time I want to be prepared for everything. My typical bag for any kind of minor meeting or work day contains a small laptop, tablet, a phone or two, flashlight, water bottle, snacks, note pad, and a dozen other things. I have tough requirements for my bags: they have to be able to hold all my stuff, be stylish, keep the stuff organized, and be comfortable to carry. I finally found a bag that fills my requirements, and it is designed by a biker girl! Public transportation or bicycle used to be my common modes of transportation before I moved to the U.S., so a backpack was the given choice. The backpack was replaced with a messenger bag when I replaced public transportation and biking with driving a car. I like many things with the U.S., but I don’t like that you have to drive everywhere; I don’t even have a grocery store within walking distance. But I digress. 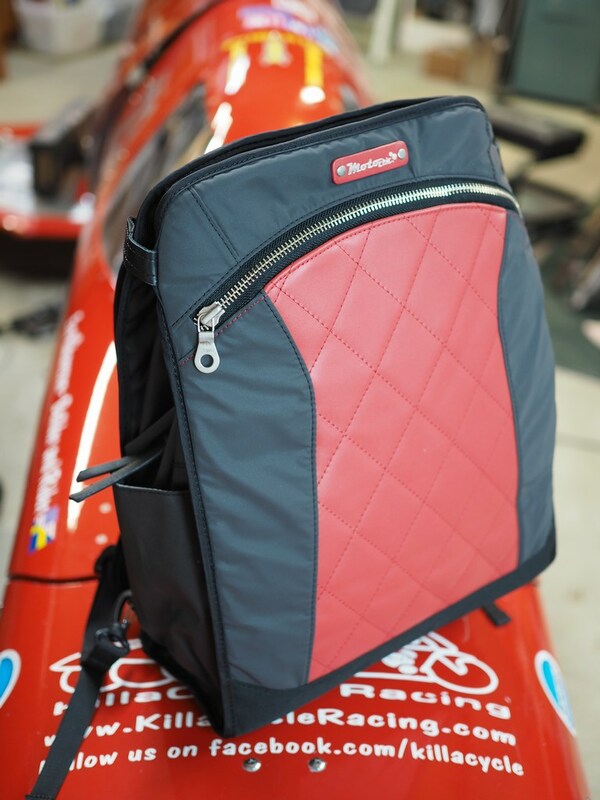 I have been looking for a stylish backpack for years, and I was delighted when I found the MotoChic Lauren. 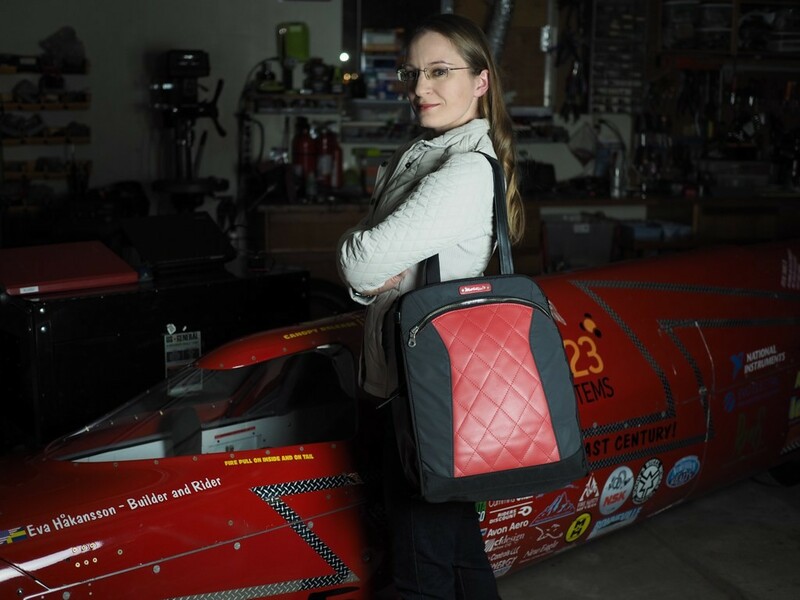 The MotoChic Lauren is designed by the biker girl Debra Chin for biker girls, and it converts from an aerodynamic backpack to stylish tote in seconds. It is made from real leather with a bunch of clever details. If you are looking for a cheap bag, this isn’t the bag for you, quality always come to price, although the Lauren will still only cost you a fraction of a regular designer handbag. 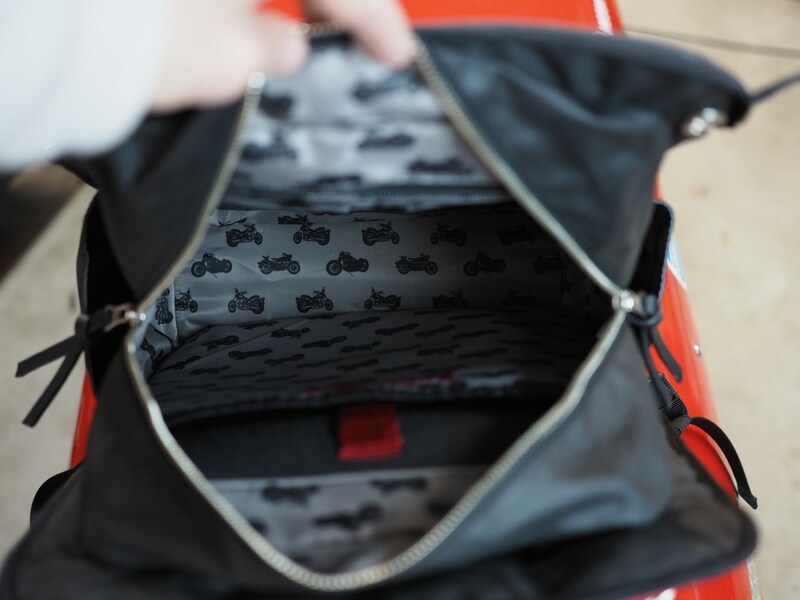 But if you are looking for the ultimate bag for biker girls, this is for you! I have been drooling at it for about a year when Bill finally bought it for me as a X-mas gift. 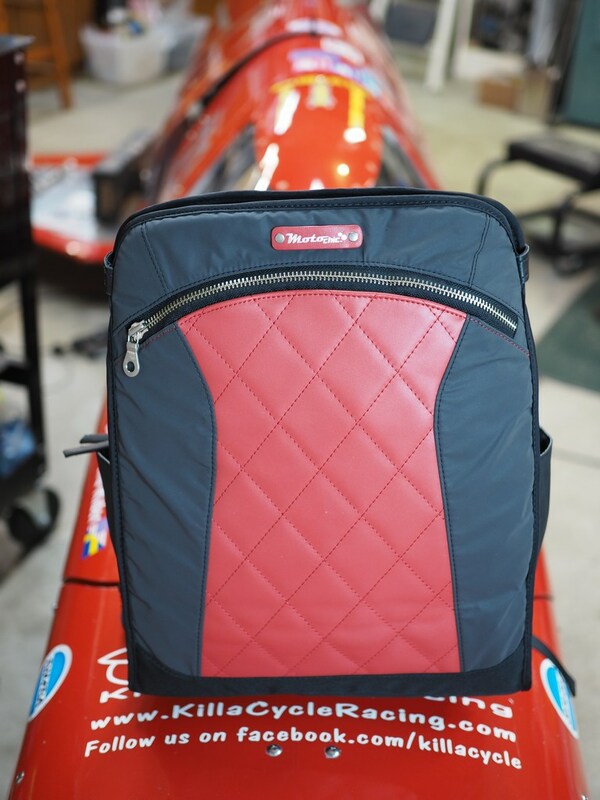 I absolutely love the bag, and I can’t wait to bring it as my “personal item” on the airplane. It fits nicely under the seat, and it is easy to carry as a backpack when you run through the airport trying to catch your flight. The unique look makes it much less likely that somebody will accidentally take your bag. Being a bit of a safety freak, I also appreciate the reflective panels (the gray fields in the photo below). A built-in rain cover will protect the leather when the weather hits. 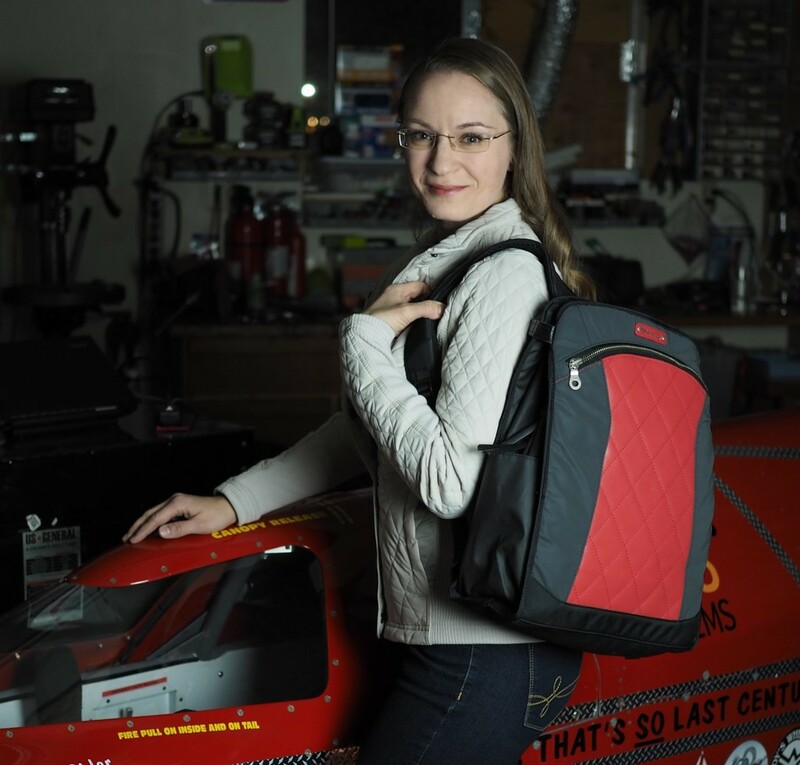 You can find the MotoChic Lauren at https://www.motochicgear.com/shop/. It comes in red, black, and white. 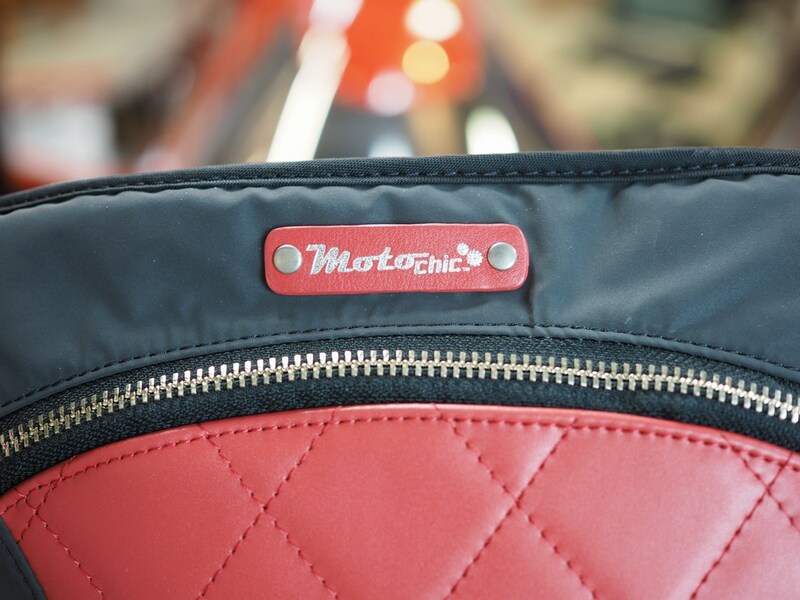 MotoChic also makes other nifty gear for bikes such as a cooling base layer and a cute purse. Despite all the nifty features, the bag was in my opinion missing one important feature: an internal light! A side effect of always dragging around too much stuff is that I cannot find what I need in my bag. Luckily, this was an easy fix. An LED strip, a button, a battery pack, a fabric ribbon, and a couple of hours of designing and sewing was all that was needed to create a convenient interior light. Pictures and procedures can be found below. 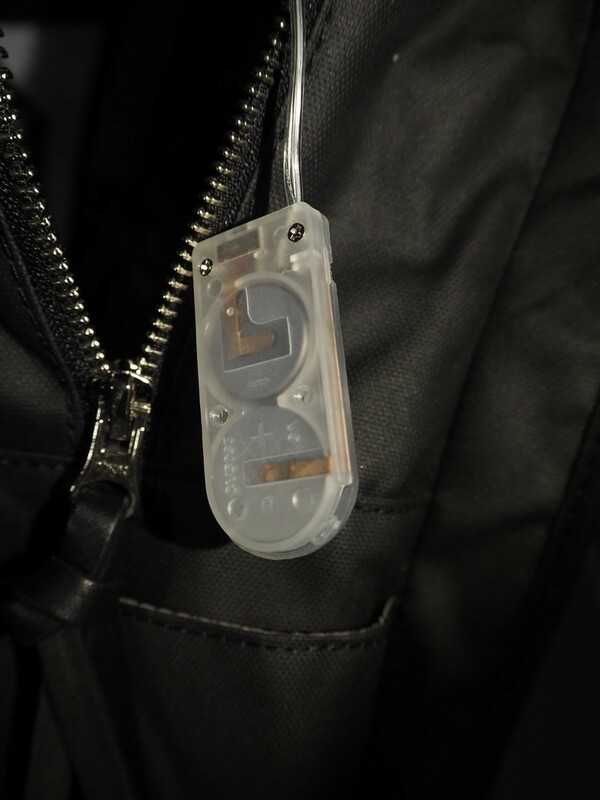 Picture: The backpack straps hides inside a pocket. 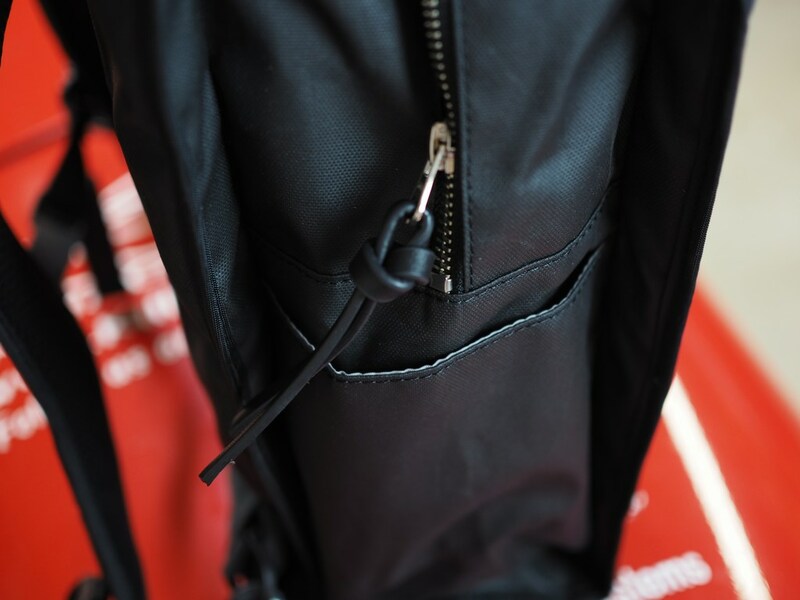 The straps for the tote bag can also be hidden in separate pockets. 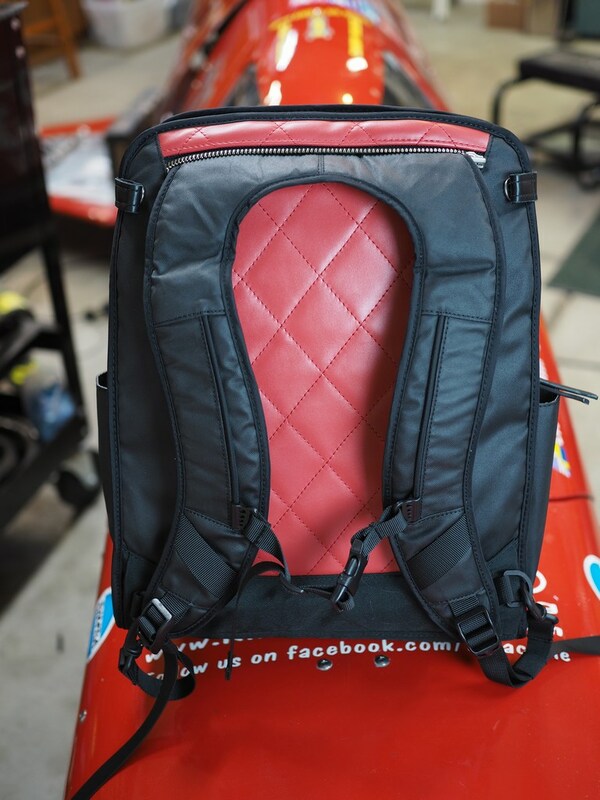 Picture: The lining has motorcycle theme and is stain resistant. What more can you ask for? 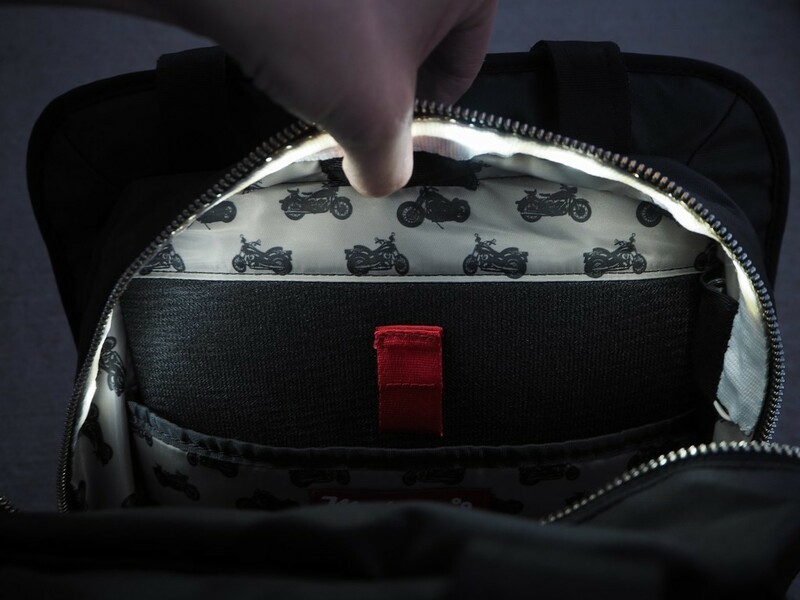 Installing an interior light in the MotoChic Lauren (or any bag) is quite simple, but it will require a bit of experience of both sewing and electrical wiring. 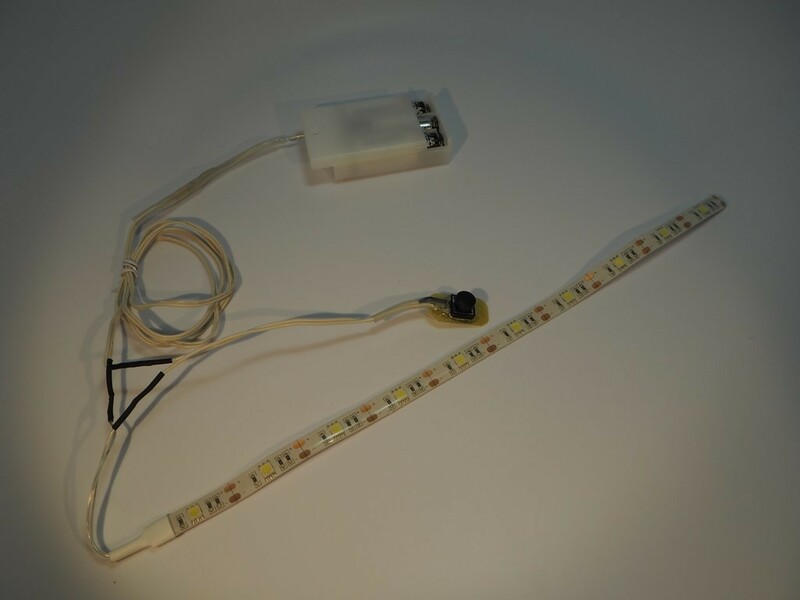 I bought a flexible and waterproof LED light strip for a few dollars online. A battery pack for three AA batteries was included (I would later replace this with a smaller battery pack with button cells, which is shown at the second to last picture). The battery pack had an on/off switch, but I also wanted a momentary switch so the light would be on only when I pressed the button. I knew that I would forget to turn off the light and the battery would run down in no time. LED strips of this kind can often be cut to length (you have to cut it where it is marked, you can’t cut it anywhere). This was no exception. I measured out how long I wanted the strip, and made sure I had a suitable white fabric ribbon that I would use to create a pocket for the strip. 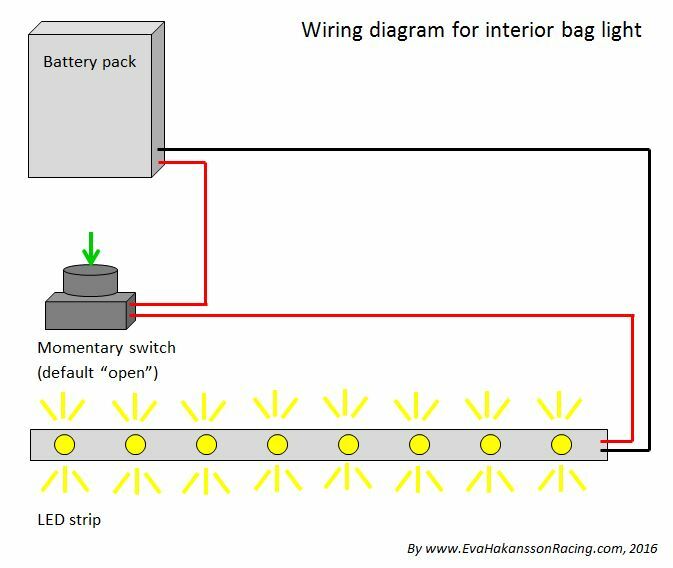 I cut the strip to length and wired in the battery pack and the momentary switch as described in the wiring diagram below. The switch has to be of the kind that is normally “open”, but that closes the connection when pushed and opens it again when released (that is often called a “momentary switch”). Note that only one of the two wires from the battery pack has to be wired through the switch. It doesn’t matter if you choose to install the switch on the positive or negative side. 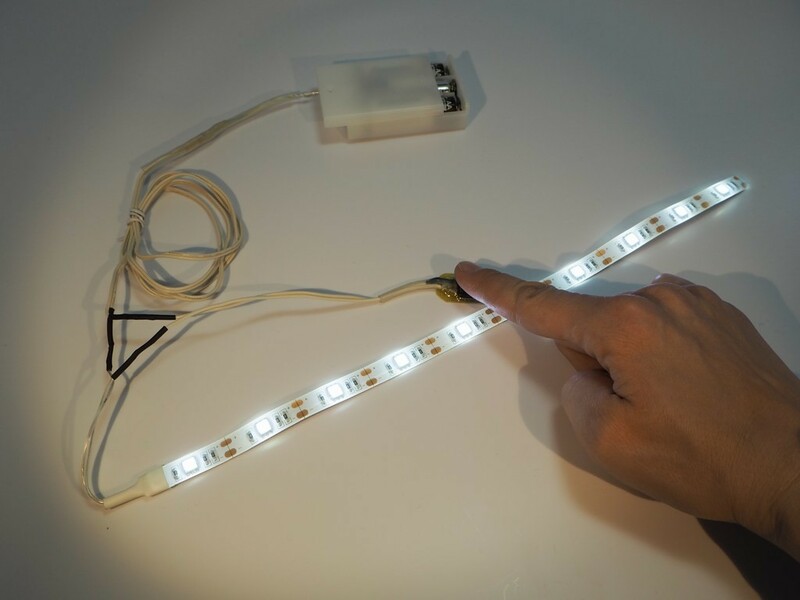 However, the polarity matters when it comes to the LED strip. The LED strip will only work when the polarity is correct. 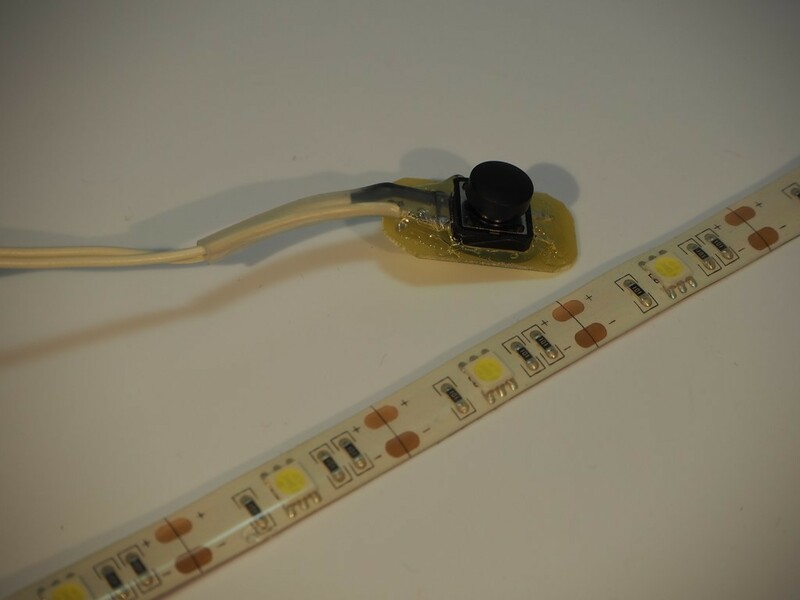 Connecting the LED strip to the reversed polarity may damage it, so try to keep track of how it was connected the the battery pack in case you need to cut both wires to change their length. The wires are often marked with dashes, text, or ribs, but might have to look really closely to see it. To protect the solder joints at the switch and provide a strain relief, I mounted the switch to a rigid piece using a hot glue. This particularly plate is fiberglass reinforced epoxy, but pretty much anything non-conductive (non-metal) will do. I would not recommend cardboard as it may absorb moisture if the bag gets wet. Picture: The switch is mounted on a plate with hot glue to provide a strain relief that protects the solder joints. It also prevents the switch from rotating in the pocket. The trickiest part was to sew on the white ribbon to the lining of the bag. I sewed it on by hand to create a long pocket, then slid in the strip and sewed it shut. I added an additional piece of ribbon to cover the switch, and another piece of ribbon to create a pocket for the battery pack. After I had taken the picture above and installed the lights, I found a mini Xmas light that had a much smaller battery pack (see below). I cut off the original battery pack and soldered on this much smaller pack that contains three button battery cells. Picture: I found this really small battery pack on a mini Xmas light chain, so I replaced the original battery pack that was at least 10 times heavier. Replacing a battery pack is easy, I just had to soldered two wired, but you have to make sure they have the same voltage! If the voltage in the new pack is too low, your LEDs will not work or will output much lower power. If the voltage is higher, it might damage your LEDs. Around 4.5 to 5 V is common (three AA, AAA or 1.5 V button cells in series). Voila! At a push of a button I can find anything in the bag!